Breakfast from America's Original Butcher looks like this - hearty skillets sizzling with meaty classics made right. These new Butcher's Breakfasts add in real steak meats, and high-quality ingredients, and big-flavor recipes on your table… plus, we've done all the work. 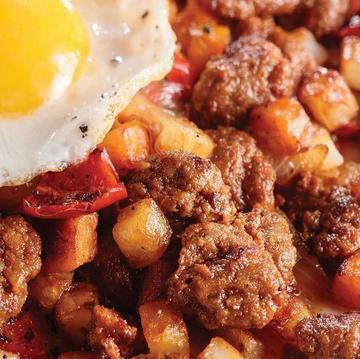 Chorizo and Sweet Potato Hash is flavorful new take breakfast hash with an exciting meat from the butcher's counter - it centers around the juicy, slightly spicy, savory flavor of chorizo sausage. This all-natural, super-zesty sausage is combined with perfectly cut sweet potatoes and Russet potatoes, slices of naturally bright red pepper, and sauteed onions. Get to know chorizo, your taste buds will thank you for it. Preheat 10" nonstick skillet to medium, add 1 T. oil and contents of bag. Cover and cook 7 minutes, stirring occasionally. Uncover, increase heat to medium-high and cook 3 minutes, stirring occasionally. Remove from heat and place contents of skillet meal into serving dishes. If desired top with your choice of cooked egg. Ingredients: Chorizo Sausage (Pork, Paprika, Spices, Water, Salt, Sugar, Dried Vinegar, Dehydrated Garlic, Natural Flavorings, Turmeric), Seasoned Roasted Russet Potatoes (Russet Potatoes, Canola Oil, Salt, Spice, Dehydrated Onion, Dehydrated Garlic), Sweet Potato, Red Peppers, Onions.